Purified recombinant protein expressed in E.coli. >95.0% as determined by(a) Analysis by RP-HPLC. (b) Analysis by SDS-PAGE. >99.0% as determined by:(a) Analysis by SEC-HPLC. (b) Analysis by SDS-PAGE. 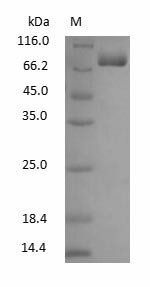 >99.0% as determined by:(a) Analysis by SDS-PAGE gel. (b) Analysis by SEC-HPLC.